For a complete, easy-to-navigate archive of all of my TNA DVD reviews, please visit Total Nonstop Ziegler! Serotonin is Raven’s group of Maverick Matt, Kazarian, and Johnny Devine. Hoyt and Matt start the match and that doesn’t go well for Serotonin. After the initial shine, Kazarian knocks Hoyt off the top rope and Serotonin uses the numbers advantage on the big Texan. That doesn’t last long before Hoyt hits Kazarian with a spinebuster and makes the tag. Truth is on fire and the match breaks down. Matt and Devine get knocked to the floor, leaving Kazarian by himself. Hoyt hits Kazarian with a big boot and Truth follows up with the Corkscrew Scissors Kick to get the win at 4:39. Serotonin was never a threat to anyone so their matches never meant anything, but this was perfectly acceptable preshow stuff. Mike Tenay and Don West are on commentary. They hype the Flag Match, the NWA World Title Match, and the Rematch. You know the one. Kevin Nash comes out to join the commentary team. Shelley’s hair is just ridiculous at this point. This is the beginning of the PCS, and everyone will earn points based on where they finish in the match. Shelley starts the match with Lethal. They’re in no hurry to get it going. Shelley takes it down to the mat and then tags the Starr into the match. They both have the support of Nash, so they work together as a team while feuding with each other. Lethal and Dutt also work together, leaving Senshi as the odd man out of sorts. The dives begin as Shelley and Starr argue with each other and appeal to Nash for validation. Dutt hits Shelley with an Ace Crusher and locks on the Camel Clutch. Starr pulls Shelley back to the middle of the ring to prevent a rope break and Shelley taps out at 7:52! Shelley gets one point. Lethal and Dutt go at each other now until Senshi tags himself in. Senshi hits a shotgun dropkick to eliminate Lethal at 8:50. Lethal gets two points. Starr works over Dutt now and trash talks Senshi. Even while they badmouth each other, Starr and Senshi tag each other in and out while they abuse the Original Playa from the Himalaya. Dutt fires back but gets drilled with the kick to the head, brainbuster, and 450 Splash combination from Starr and Dutt gets eliminated and three points at 13:12. We’re down to the final two now. Senshi hits the Tidal Wave but only gets two. He tries the Ki Krusher but Starr reverses it to a Crucifix Bomb. Starr then hits a Brainbuster and goes up for another 450 Splash but Shelley comes back out and distracts him, allowing Senshi to avoid the splash and get an inside cradle for the win at 14:38. That was a good opener and I like the interaction between Shelley and Starr. Jerry Lynn is the special guest referee for this important contest. Daniels has been the champion since 11.16.06 and this is his second defense. They trade some holds back and forth, with Sabin stretching the boundaries of the rules from the get-go. The champion takes the first advantage and wears Sabin down, using an Arabian Press (not a split-legged moonsault as Tenay calls it) for two. Sabin comes back and hits a springboard missile dropkick to knock Daniels to the floor. He follows Daniels out and hiptosses him on the ramp. Back in the ring Sabin stays in control, focusing on the head and neck. Daniels comes back with an STO and a series of clotheslines. A back body drop and a tilt-a-whirl backbreaker get two. Daniels goes for the Angel’s Wings but Sabin slides to the floor. The champ follows him out and runs him into the barricade. Daniels follows up with a dropkick through the ropes, and then hits an elbow drop from the middle rope to the floor! That’s a good spot. Back in the ring Sabin is able to fight back with a tornado DDT for a two-count. Daniels comes back with a Death Valley Driver for two. He then hits the Flatliner and turns it right into the Koji Clutch. Sabin is able to reach the ropes, and then rakes the eyes. He hits a running Yakuza kick, but then tries a springboard maneuver but takes a palm strike instead. Daniels hits a uranage slam and the Best Moonsault Ever to get the pin at 12:27. I don’t see how either the Sabin versus Daniels or Sabin versus Lynn issues could be furthered by the fact that Sabin just lost completely clean in the middle of the ring. They try to salvage something by Lynn telling Sabin to show Daniels some respect, but Daniels says he doesn’t care about that. Lynn then slaps Daniels in the face. It seems like Lynn is always sticking his nose into business that’s not his own. He’s really obnoxious. The match was solid stuff but nothing amazing. Jim Cornette introduces Dale Torborg and A.J. Pierzynski from the Chicago White Sox, as well as 2006 World Series MVP David Eckstein from the St. Louis Cardinals and his brother Rick. Eckstein wrote a book, which annoys Torborg and Pierzynski, so they turn heel on him. They attack until Lance Hoyt makes the save. This was a brutally stupid feud based on, as far as I can tell/remember, absolutely nothing. Rhino wanted to “help” AJ but in regards to what is unclear. AJ attacks Rhino during his pre-match interview and the fight is on. They battle throughout the backstage area and into the Impact Zone crowd. Finally they make it to the ring and the bell rings to officially start the match. AJ takes control and continues working on the back. He hits The Dropkick but it only gets two. Rhino comes back and goes to the second rope, but AJ knocks him down to the floor. AJ follows him out but jumps right into a belly-to-belly suplex. Both men make it back to the ring and Rhino hits a spinebuster for two. AJ tries a Styles Clash but Rhino backdrops him to the floor and AJ has apparently badly hurt his knee. He calls the referee to the floor, and Andrew Thomas makes the now-meaningless “X” sign. After a bunch of referees come down and check on AJ, he sneaks back in the ring and rolls Rhino up for a quick pin at 7:28. The match was pretty dull, but to continue the feud that was a solid finish. Homicide and Hernandez are the current NWA World Tag Team Champions, but the titles are not on the line here. They’re accompanied by Konnan, while AMW are accompanied by Gail Kim. The object of the match is to capture your country’s flag and hang it using a ladder. Whichever team wins will get to have their country’s national anthem played in the arena. The match starts on the floor as a big brawl. Gail gets involved early, hitting a moonsault on Homicide on the floor! Even with Gail’s interference, LAX is able to take control on both Storm and Harris. AMW fights back and this one continue to be a big brawl. A ladder gets involved and Hernandez hits Harris with the Crackerjack right on the ladder! LAX continues controlling the action, and Gail interferes again to give Harris the chance to hit Homicide with a superplex. Hernandez comes back in and is able to grab the Mexican flag. He tries to hang the flag but Storm stops him and hits a sunset bomb. Harris recovers and grabs the American flag but Homicide cuts him off and hits a super Ace Crusher. Homicide goes for the Gringo Killer but Gail interferes again with a missile dropkick. Gail then stumbles around looking lost while Konnan just watches. She grabs the flag and goes to hang it but finally Konnan gets involved and throws her off the ladder. It’s about time she got what was coming to her. Petey Williams then comes running out and tries the Canadian Destroyer on Konnan, but Hernandez breaks it up. Hernandez then delivers a no-hands dive over the top rope to the floor to take out Storm. Meanwhile Harris and Homicide climb the ladder with their respective flags and they both hang part of them. Storm comes back in and tries to hit Homicide with a beer bottle but he hits Harris instead! Hernandez then climbs the ladder to hang the flag and win the match at 10:42. After the match Storm blames Harris for the loss. As for the match itself, it was disjointed and awkward in a number of spots with tons of Gail Kim interference thaw wasn’t really necessary. After the match the Mexican anthem is played while Homicide tries to get the back of his head to stop bleeding. This is another brutally stupid segment in which BG James and Kip James dress up like “Paul Levesque” and “Michael Hickenbottom.” They have fake cheerleaders come out to simulate the Spirit Squad. It’s incredible how much time TNA wasted mocking the WWE in segments that went nowhere and nothing for no one. They even have their own fake Fat Oily Guy. BG then cuts a ridiculous angry promo. As if either of the Voodoo Kin Mafia could hold a candle to Triple H or Shawn Michaels in any area of the business. This is insulting on so many levels. BG then puts up $1 million if Triple H and Shawn Michaels will fight them somewhere. He speaks in kayfabe terms and further kills the business with his idiotic rhetoric. I think I hate this more than anything ever on a TNA show. Abyss has been the champion since 11.19.06 and this is his first defense. Sting dominates the early going, as I would expect him to. The battle spills to the floor and Tomko interferes, throwing Sting into the guardrail. Back in the ring Abyss crushes Christian in the corner and wears him down. Christian fights back with a tornado DDT for two, and then knocks Sting off the apron. Abyss and Christian continue to battle, taking the fight to the top rope, and that’s when Sting comes back in and instigates a Tower of Doom. Sting starts throwing out Stinger Splashes and no-selling Christian’s offense. He uses Abyss and Christian against each other, as Tomko is an equal opportunity offender when it comes to interfering behind the referee’s back. The referee gets distracted and Christian tries to use the belt but Sting blocks it and hits the Scorpion Death Drop. It only gets two when Tomko pulls the referee to the floor. Tomko gets in the ring now and wears Sting down, only to be stopped by Abyss, who clotheslines him to the floor. Abyss then press slams Christian to the floor. He goes for a Chokeslam as Mitchell gets out a bag of tacks. The NWA World Champion spreads out the tacks (I imagine Harley Race never thought that sentence would ever be typed) and signals for the Chokeslam again. Christian comes back in so Abyss tries to Chokeslam him instead and Tomko breaks it up. Tomko then stomps Abyss’s head into the tacks! Sting knocks Mitchell off the apron and then appeals to Abyss’s inner man. He goes for the Scorpion Deathlock but Christian breaks it up with a steel chair. Abyss grabs Sting for the Black Hole Slam, knocking Christian down in the process, and getting the pin on Sting at 11:56. Sting barely got off the ground for the Black Hole Slam and it looked lousy. Aside from that the match was fine but had tons of interference during the ref bump, like so many TNA World Title matches. Angle stated emphatically that win lose or draw this will be his last match with Samoa Joe. They start chain wrestling right away as the crowd is juiced, chanting for both men. Angle starts working the ankle, and Joe responds with a multitude of strikes. They spill to the floor and Angle actually hits Joe with a house show dive. Not often you see Angle doing dives. 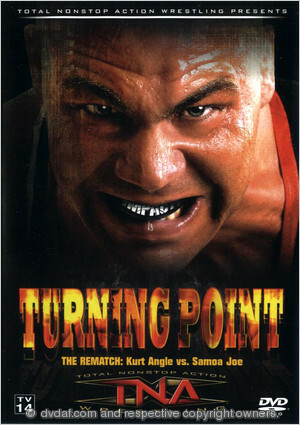 Angle uses the ring steps to abuse Joe’s face. Back in the ring Angle continues to keep Joe on the mat, despite the Samoan’s comeback efforts. Finally after several minutes Joe is able to hit a release German Suplex and both men are down. Back on their feet Angle responds with rolling German Suplexes, hitting three of them. Angle goes for the Olympic Slam but Joe avoids it, but Angle hangs on and tries the Ankle Lock. Joe rolls out of it and drills Angle with a knee to the face. He sets Angle up for the Muscle Buster but Angle counters it with the Ankle Lock! Joe rolls out again so Angle hits the Olympic Slam for a two-count. Angle’s straps come down and he goes right back to the Ankle Lock. Joe counters to the Choke but Angle re-counters back to the Ankle Lock, and Joe re-re-counters to the Choke. Angle re-re-re-counters back to the Ankle Lock but Joe reaches the ropes. They fight up to the top and Angle hits a super belly-to-belly suplex for a two-count. The referee takes an unfortunate bump. Angle tries the Olympic Slam but Joe counters out with an armdrag. Joe locks Angle in the Choke and Angle taps out but the referee didn’t see it! As Joe tries to wake up the referee Angle kicks him square in the nuts. The crowd rightfully boos. Angle goes to the floor and grabs a steel chair. When he tries to hit Joe with it Joe ducks and the chair bounces off the ropes and back into Angle’s face! Joe then locks on the Choke again and this time the referee sees Angle tapping out and Joe wins at 19:13! Time has diminished this a bit, since Angle has copied this “hit a million finishers” style ad nauseam in the last few years, but this is still a great match and Angle made Joe look like a million bucks. That evens the series at 1-1.